While the Blackhawks are taking turns touring Stanley’s trophy around the world, moves are being made back home that influence the future of the franchise. Teuvo Teravainen was recently signed to a three-year deal under Chicago and his highlight reel is causing quite a stir. However, the first round, 18th overall pick won’t be suiting up at the United Center next season. His agent told the press that he’ll be playing at least one more season in Finland’s elite league on the Jokerit’s roster before coming to North America. He might be worth the wait. He tallied up 31 points in 44 games last season at the tender age of 18. He was ranked 4th at the 2013 U20 World Championships with 11 points (5G, 6A) in only six games. When he does get to the NHL, he will bring a second wind to the Second City. On the other end of the ice, Corey Crawford is looking at some future questions. Crawford has one year left on his contract and last season’s heroics, while thrilling, raise important matters as to his future. After this season, Crawford becomes an unrestricted free agent. His contract totals about $2.7 million now, and will likely go up when it’s time to negotiate. It will be right around the same time that Jonathan Toews and Patrick Kane will be ready to renew their contracts as well. 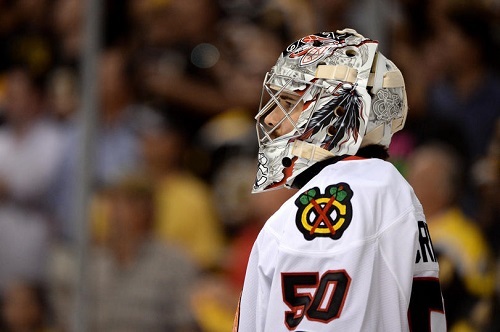 BOSTON, MA – JUNE 24: Goalie Corey Crawford #50 of the Chicago Blackhawks looks on against the Boston Bruins in Game Six of the 2013 NHL Stanley Cup Final at TD Garden on June 24, 2013 in Boston, Massachusetts. While Crawford is a big piece of the team, Toews and Kane will most likely take precedence. Meaning Crow will have less room under the cap to find his spot on the roster. However, the league salary cap ceiling will also most likely rise, which is good news for everyone. If Crawford asks for a raise, he just may be worth it. He posted the second best playoff GAA in team history last season with 2.04. He can read the stats too and he may use those impressive numbers to test the market and shop himself around to the league. If he does, he may find a team looking for a number one goaltender and be willing to give him a fat paycheck to start every night. Although, leaving a team that helped propel you to NHL history and put your name on the Cup will be hard to do. Chicago’s fanbase is behind Crawford and the potential to win more cups in Chicago is a real possibility. Rookie Antti Raanta has just been signed to Chicago as well, but he will spend some time in the American Hockey Leage before he becomes Chicago’s netminding successor. According to Stan Bowman, Raanta has a bright future in the NHL. And with Nikolai Khabibulin already an NHL veteran, he can’t be expected to be around forever. The goaltender situation in Chicago will be very interesting this season, with Crawford’s performance being a factor. However, look for Chicago to attempt to resign Crawford before the season’s end, and don’t be surprised if he resigns and stays in the Windy City.